Your Frisco plumbing is comprised of two parallel subsystems. The first brings fresh water into your house. The second, which removes wastewater from your house, is the drainage system. The latter includes three components – drain, waste and vent – and is thus often referred to as the DWV system. Frisco drain lines collect water from the various fixtures. Waste lines carry toilet wastes and vent pipes, which protrude from the roof, allow harmful sewer gases to evaporate, thereby relieving pressure from the drain pipes and enabling waste to flow properly. Drain and waste lines tilt downwards thereby allowing gravity to naturally transport their contents. Their final destination is the main sewer line, which carries waste matter to a sewage facility or to a septic tank. Vents are not the only means by which hazardous gases are blocked from your house. An additional device known as a trap fills a similar function. A trap is the curved section of the drainpipe, located next to each fixture. Whenever a fixture is used, some of the water flows through the trap into the drainpipe, but a sufficient amount of water stays within the trap, and in fact forms a seal which prevents sewer gases and objectionable odors from permeating your home. To reduce the chances of blockages and clogs, drainpipes are larger than water pipes; their diameter ranges between 1 ½ in. and 4 in. Toilet drainpipes are usually 4 in. in size, shower drains are served by 2 in. pipes and sinks and bathtub drains have 1 ½ in. to 2 in. pipes. Even with this carefully calculated and methodical engineering, clogged drains happen. Most lines should include a clean-out, through which a Frisco Plumbing Pro representative can clean out the pipe. Standard tools for clearing clogged drains include plungers, various types of augers such as plumber's snakes and toilet augers, as well as sewer tapes. If your home does not have ground level clean–out, you may want to explore the installation of this critical fixture. Without this clean–out, the technician must access you main drain from a roof vent which is often more expensive. If it is the drain outside your house that is clogged, it might be due to tree or bush root intrusion. If roots are the case, then the problem may be severe, and might end with changing to a PVC pipe. 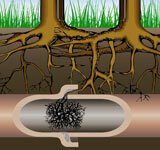 Rooter services are provided by Frisco Plumbing Pro to target the reoccurring problem of root invasion. Frisco Plumbing Pro offers a full service Frisco plumbing and drain service repair company in the Dallas area. This includes water heaters, pumps, shower fixtures, toilets, pressure regulators, water service lines, sewer service lines, gas lines and most anything related to plumbing. Our associates have the necessary equipment to clear blocked drains, camera inspect pipes and leak detect water and gas lines. At Frisco Plumbing Pro we know how stressful problems with drains and pipes can be. In most cases they are an emergency. For quick and professional service give us a call immediately at (972)332-3926. Q: What is a hydro-jetting service? Hydro-jetting is the most effective way to scrub away scale, grease, sludge, roots and other debris from your main sewer line. Our hydro-jetting service will get your old pipes running like new again. A: No. We would recommend that you call a qualified, trained and certified Frisco plumber. Why? The water pipes inside and outside your home can be very delicate. Older style pipes have a significantly shorter lifespan. In an older home, pipes wear thin from the inside out making them appear sound but in fact are very brittle. An unqualified and unskilled rooter company could cause extensive damage to your pipes and your home. Our highly trained Frisco plumbers will take the time to properly diagnose the problem and use the right tools and techniques to solve the problem. Utilizing video technology, our technician can even show you the problem before the repair even begins. Should there be an issue of a broken pipe or other unforeseen problems after we begin the job, our expert Frisco plumbers can immediately take action. Q: I’ve been told I need to replace my pressure reducing valve. How does it work? A: A pressure reducing valve (PRV) is installed in series directly after the water meter in homes and commercial buildings where the municipal water pressure is high. A PRV automatically reduces the pressure from the water supply main to a lower, more acceptable pressure. Water entering the valve from the municipal water supply is constricted within the valve body and directed through the inner chamber controlled by an adjustable spring loaded diaphragm and disc. Even if the supply water pressure fluctuates, the pressure reducing valve ensures a constant flow of water at a functional pressure, as long as the supply pressure does not drop below the valve's pre-set pressure. The PRV is designed to protect the fixtures in your home from the excessive water pressure. You may also need to replace your thermal expansion tank. Q: My sewer seems to get clogged every several months. Is there anything I can do to fix this? A: The real issue is what is causing your sewer to back up. To properly diagnose this problem, a video inspection of your line should be conducted by an experienced Frisco plumber. It possible you have a root invasion or a crack in your line. Call us today to arrange for a comprehensive sewer line inspection today. Q: How can I tell if a drain vent is clogged? A: Sometimes this can be a challenge. If you smell sewer gas in your home then a clog is possible. Also a good sign is when a toilet bubbles or gurgles when flushed. The vent system is designed to relieve pressure or vacuum in the drain system as water passes through the pipes. If you suspect any type of drain blockage, call the Frisco plumbers that are drainage experts at (972)332-3926. Q: Can high water pressure be the cause pipe leaks? A: Yes. Unusually high water pressure, in excess of 60psi can cause other problems that can also lead to leaking water lines. Frisco water pressure can range from 50—120psi without a pressure reducing valve. One of the most significant is water hammer or banging pipes. A banging pipe can cause vibration through your entire water system. This, in turn, leads to an increased risk of water line leaks. If you suspect your water pressure is to high, give us a call today for a complete analysis of your water supply system. Q: How can I tell if I have a slab leak? A: Without a professional inspection, you can’t be sure, but some of the signs are: a wet or hot spot on your floor, the sound of running water or an increased water bill. If you suspect a leak under your slab foundation, don’t wait to repair it because that leak may cause damage to your home. Q: Is there one simple thing I can do to keep my drains running well? A: The simplest way to keep your drains working in to use plenty of water when using a sink. By not using enough water, you often leave debris in the trap which will ultimately build up and cause slow or clogged drains. This is especially true for your kitchen sink. You must use enough water to push all disposal waste into the main sewer line. If you are experiencing slow or clogged drains, give us a call today. Currie Precision Tool Co. Inc.